Germany proved once again that its home to some of the top grinders in the world as four of its finest put on a dominant performance in yesterday's EPT London Super High Roller finale. The inaugural £50,000 re-entry event attracted a total of 57 entries but by the time the final table rolled around a total of four Germans were amongst the surviving eight. The star-studded showdown featured a host of familiar faces, including Patrik Antonius, David Benefield and Timothy Adams, but when they'd all dispersed it was Martin Finger who began to dominate. After watching Johannes Strassmann move all-in with Jh 9c, Finger flat called with pocket queens and watched as Bill Perkins moved all-in behind with Ac Jd. A set of queens for Finger sent Strassmann and Perkins to the rail in fifth and fourth respectively, leaving three Germans vying for the title. Discussions of ICM soon dominated the conversation but amongst the talk of stats and shoving ranges the demise of Christoph Vogelsang came. That elimination left just Tobias Reinkemeier in the way of Martin Finger but after an all-in encounter with pocket eights it was the former heading to the rail. 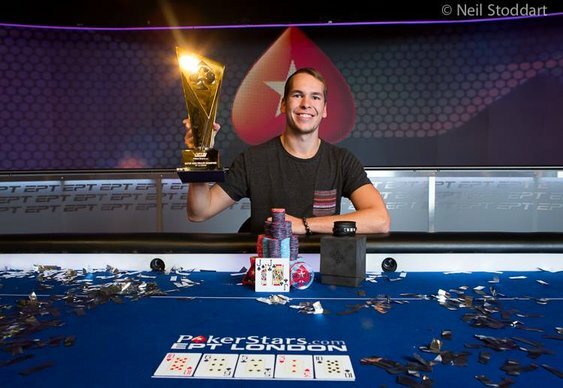 Indeed, Finger's pocket jacks were able to swerve any bad luck as the board ran out: Th 6s 5c 3h Ts to give the young German the first EPT London Super High Roller title and £821,000. Finger is no stranger to success on the European Poker Tour having previously won the Main Event at EPT Prague. This latest triump take his live tournament earnings past the $3.7m mark. Qualify for future EPT events at PokerStars. Download the PokerStars software via Bluff Europe and sign up using the code STARS400 and you can enjoy a 100% bonus on your first three deposits up to $400 as well as four tickets into $1,000 freerolls every day for 31 days.